This is a great interpretation of a modern classic. 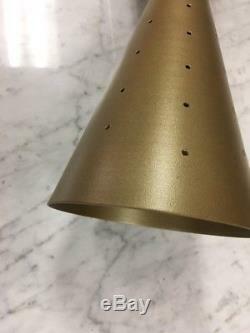 This is spun right here in the USA and is reminiscent of the Light O Lear 1950's and 60's classic Bow Tie sconce lamps. 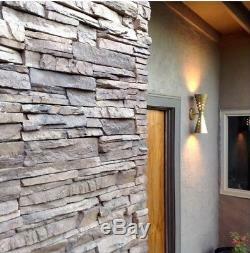 These are great accurate replacement lamps for entry, foyer and easements on your modern Alexander, Eichler, Cody or Wexler mid-century modern home or office space. They work well inside or outside. The light adds a stylish spatter of light created by the pinholes that really add a cosmic vibe to the wall. Lamp measures 16" in height and it sets approximately 6" off wall when mounted, These are ready to hang upon arrival and it includes "T" strap hardware. The item "Atomic 50's 60's style mid-century modern bow tie dual wall sconce lamp GOLD" is in sale since Tuesday, September 18, 2018. This item is in the category "Collectibles\Vintage, Retro, Mid-Century\Unknown". 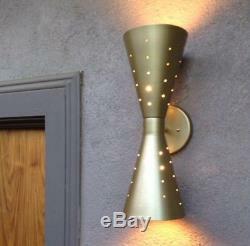 The seller is "modcenturyjoe" and is located in Palm Springs, California. This item can be shipped to United States, Canada, United Kingdom, Denmark, Romania, Slovakia, Bulgaria, Czech republic, Finland, Hungary, Latvia, Lithuania, Malta, Estonia, Australia, Greece, Portugal, Cyprus, Slovenia, Japan, China, Sweden, South Korea, Indonesia, Taiwan, South africa, Thailand, Belgium, France, Hong Kong, Ireland, Netherlands, Poland, Spain, Italy, Germany, Austria, Israel, Mexico, New Zealand, Philippines, Singapore, Switzerland, Norway, Saudi arabia, Ukraine, United arab emirates, Qatar, Kuwait, Bahrain, Croatia, Malaysia, Brazil, Chile, Colombia, Costa rica, Dominican republic, Panama, Trinidad and tobago, Guatemala, El salvador, Honduras, Jamaica.